MDC Vice President Morgen Komichi says the government should proceed to arrest the head of the Catholic Church, Pope Francis if it was determined to account for leaders of the various groups that took part in last week's protests over fuel price increases in Zimbabwe. 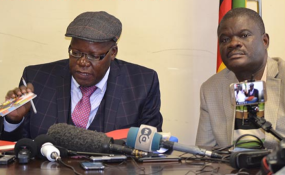 Komichi was addressing a media briefing at the Morgan Richard Tsvangirai House in Harare Tuesday. He rubbished government claims the main opposition instigated the deadly protests adding that the demonstrations were a spontaneous reaction by angry groups of locals. State Security Minister Owen Ncube said during the height of the deadly skirmishes last week that the main opposition has been calling for protests against the Zanu PF led administration and should shoulder the blame for the trail of destruction left by the protests. Four MDC MPs have since been arrested facing subversion charges which carry up to 20 years imprisonment if one is found guilty. Komichi said government was mistaken in its attempts to classify protesters according to their political parties and other group identities. "If we really go back to what happened last week, it was a citizen movement. That is citizens standing up against the government," he said. "Why then be selective and choose the MDC because among the people that were killed, victimised, are some from the Catholic diocese, some from the vendors, it was a mixture of all those people." There were unconfirmed reports this week the state may consider arresting MDC leader Nelson Chamisa and link him with the skirmishes. But Komichi felt if authorities were to go by arresting leaders of groups that took part in the protests, they should proceed to arrest leaders of the pontiff whose church members were also involved. "Why then be selective and say MDC alone was responsible for the action? If they are to arrest the MDC leadership, they must go and arrest the Pope at the Vatican and the Anglican Bishop because their people were also involved in these mass demonstrations. "We do not want to create a situation where they put the blame on us. The challenge of last week was the people's challenge and actually triggered by President Mnangagwa himself," Komichi said. Mnangagwa has condemned the violence while vowing his administration shall probe the disturbances including reports the military killed civilians.